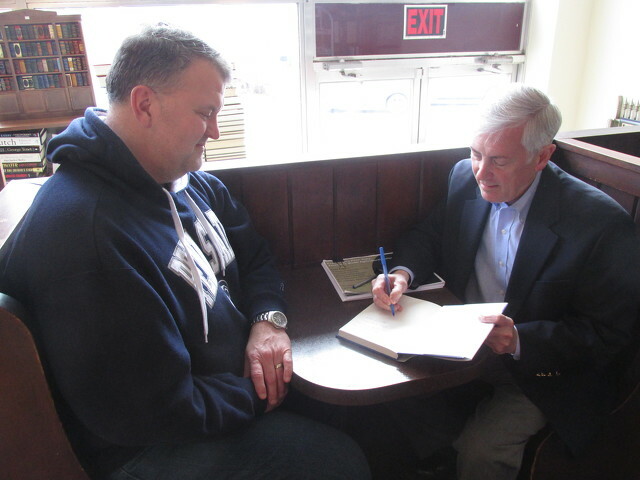 REBERSBURG — Acclaimed author and higher education historian Roger L. Williams held a book signing at Forefathers Book Store in Rebersburg on April 8. Williams recently penned “Evan Pugh’s Penn State: America’s Model Agricultural College,” which chronicles the life of Pugh, the first president of the Farmers High School, the institution we now know as the Pennsylvania State University. Williams, originally from Huntingdon, has three degrees from Penn State in history, journalism and higher education. He began working for Penn State in 1978 as a writer/editor in the department of public information. He served as executive director of university relations, then later as executive director of the Penn State Alumni Association, retiring in 2015. Williams wrote his doctoral dissertation on George W. Atherton, who served as PSU president from 1882 to 1906. “In doing my work on Atherton, I came in contact with Pugh,” said Williams. “I always wanted to do a book on Pugh, but I couldn’t do it until I retired and had the time.” The book is a full biography of Pugh, but focuses on his affiliation with Penn State. Williams said Pugh, born in 1828, was from Oxford, Pa., from a family of farmers and blacksmiths. He was tutored by his aunts in algebra, geometry, geography, history, Latin and stenography, then ran his own school, Jordan Bank Academy, for five years. He studied at German universities for six years, then went to the Rothamsted laboratory in England. In England, he conducted experiments to determine how plants assimilate nitrogen, laying the foundation for the ammonium nitrate fertilizer industry. His reputation garnered him an invitation to be the president of the Farmers High School in 1859. He served in that capacity until his untimely death from typhoid fever in 1864 at the age of 36. The book is available at Forefathers Book Store and online by emailing k[email protected]. Williams’ book signing coincided with the fifth anniversary of Forefathers Book Store, which opened April 11, 2013. Keith Bierly and his wife, Kim, own and operate the store, along with the Main Street Yarn Shop in the same building, the former First National Bank building at 121 E. Main St. The building retains some of its former banking trappings. Sales are rung up at the former tellers’ counter, and the bank vault, with its door chained open and still containing safety deposit boxes, is filled with books. The bank’s stamped metal ceiling and pendant-style lights also remain intact.